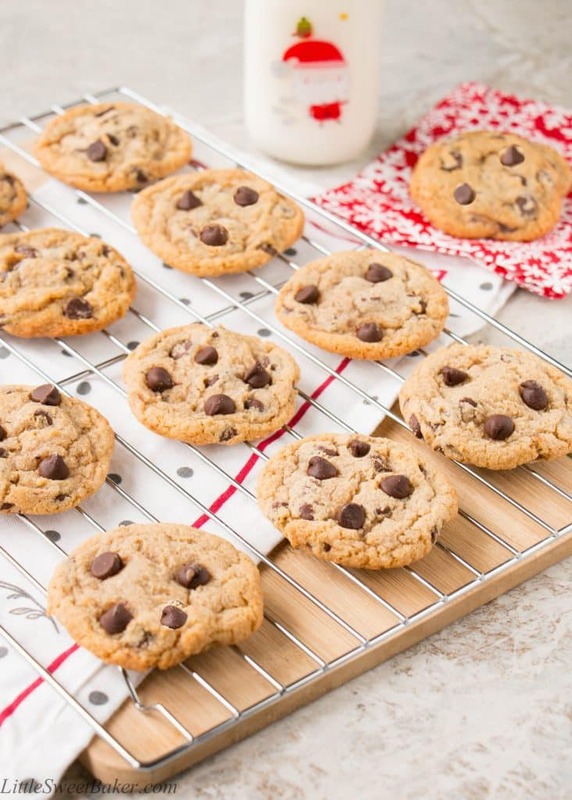 These cookies are loaded with chocolate chips, crispy on the edges, and oh so chewy! This make-ahead recipe is perfect for a busy holiday season. Tomorrow is the first day of December which means the holiday season is in full force. It’s time for bake sales, craft sales, office parties, cookie exchanges, get togethers, and shopping for gifts! I know this time of year can be stressful for some people, but I think prep is key to a stress-free holiday season. However, I am certainly no expert at this. There were years when I have been able to stay clear of the busy malls during the month of December because I was done all my shopping, and then there were years when I was at the mall the day before Christmas trying to make the best of what was left. 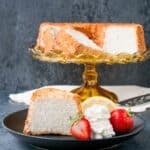 One of the things I do find very helpful for me is to get all my baking done ahead of time because most baked goods are easily freezable. I already have some sugar cookies and ginger molasses cookies stowed away for my son’s school bake sale coming up. 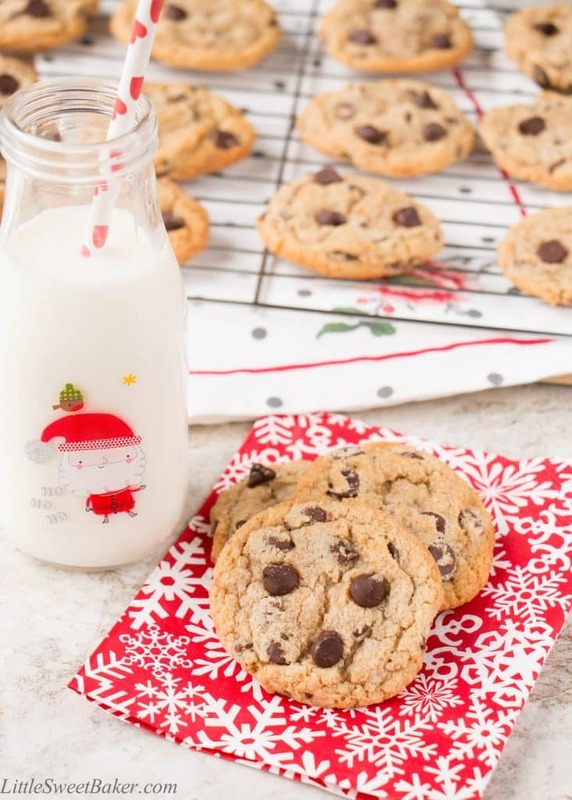 I have a couple of batches of these chocolate chip cookies ready to be freshly baked for my husband’s office party, my kid’s playdates, and get togethers with my friends. 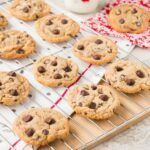 Nothing is better than freshly baked chocolate chip cookies that are still warm from the oven and that’s what I love about this recipe. It makes 5 dozen cookies and you can store the dough in the refrigerator for up to 3 days or in the freezer for up to a month. 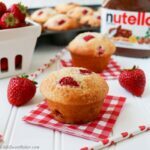 You do need to plan 1 day in advance for this recipe because after preparing the dough, you must chill it overnight. David Leith from the New York Times explains, “This allows the dry ingredients time to soak up the wet ones, which results in a firmer dough. 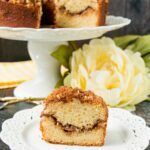 It leads to a marvelously chewy, chocolate-rich cookie.” I also find that it really brings out the deep caramel flavor of the brown sugar and enhances the aroma of the vanilla extract. All in all, it’s truly worth the wait. 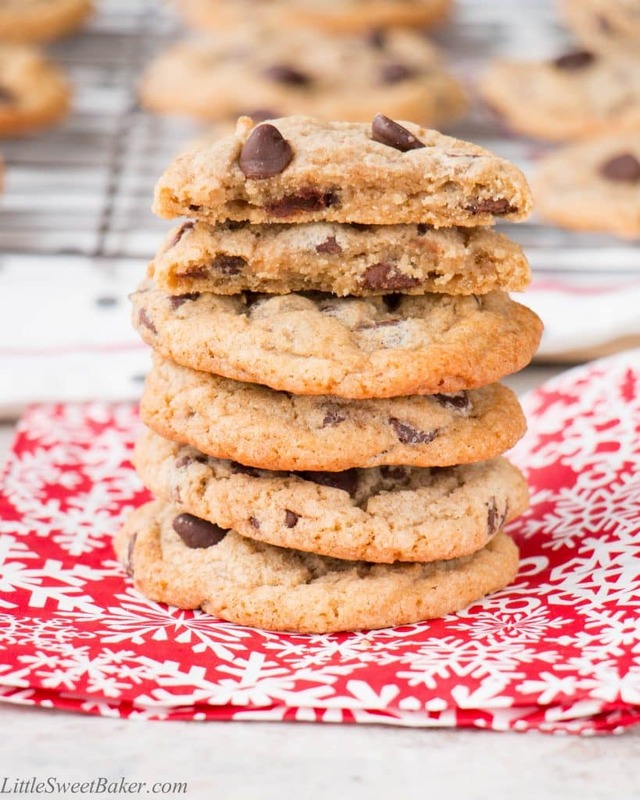 These cookies are chewy, studded with chocolate chips and with wonderful flavors of brown sugar and vanilla. The dough is easy to prepare and store, so that it’s ready to be freshly baked for all your holiday entertaining. Using an electric mixer with a paddle attachment, cream butter and sugars together until very light, about 5 minutes. Add eggs, one at a time, mixing well after each addition, then mix in the vanilla. Reduce speed to low. Add in the dry ingredients in 2 batches until just combined (batter will be very thick). Fold in the chocolate chips. Scoop out rounded cookie doughs and place onto a large plastic container with lid or onto a baking sheet. Cover with lid or tightly wrap with saran wrap and chill in the fridge overnight or up to 72 hours. When ready to bake, preheat oven to 350F. Line a baking sheet with parchment paper or nonstick baking mat. Place a dozen cookie doughs 2″ apart on the baking sheet and bake for 8-10 minutes or until the edges are lightly browned. Let the cookies cool on the baking sheet for 5 minutes, then transfer to a cooling rack. Dough can be used in batches, and be refrigerated for up to 72 hours. 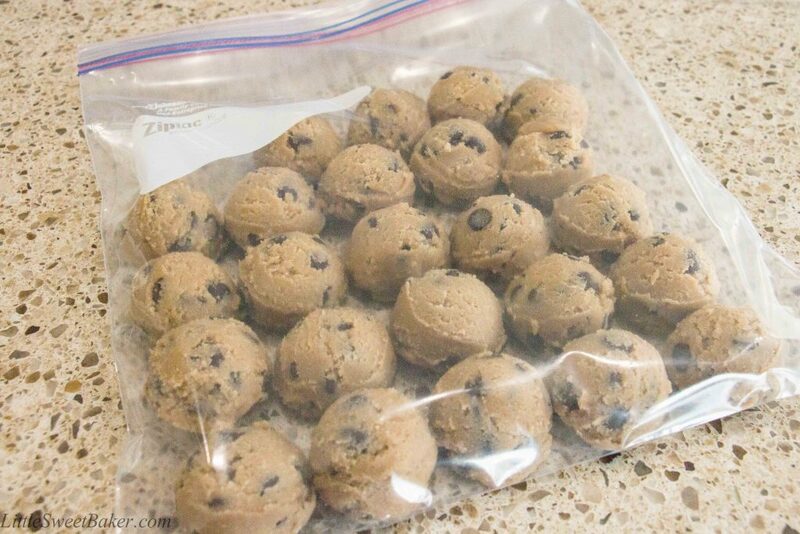 You can also chill the dough, then place them in a ziplock bag, and freeze for up to 1 month. To bake the freezer cookie dough, just thaw in the fridge overnight or at room temperature for 1 hour, and bake as instructed.